No matter how many times I have read how the date for Easter is determined, I always forget. So, here is the short answer: Easter falls on the first Sunday after the first full moon following the Spring Equinox. I will probably have to look it up again next year. Easter held a special reverence for my childhood family. We had weeks of prayer and contemplation and we wore special, new clothes for Easter Sunday. We were quite decked out when we attended church every Easter. It made us feel renewed and happy. How wonderful to have lived in an era where we had an oven timer with an automatic start feature. Our home would be filled with wonderful fragrances when we returned from church - it was the Easter ham! Unfortunately, the ham curing process must have been quite different when I was a child - we could never be sure if the ham was going to taste good or if it would turn out to have what Mother called a 'boar' flavor. In addition to such concerns, some hams were often too salty. I remember the times my mother soaked a large whole ham before she baked it in order to remove some of the salt. As a wife and mother, my Easter traditions grew with each clever recipe or decoration featured in the monthly magazines. At one point I had too many idea. To keep my sanity, some things were kept and others discarded, but I would always make an Easter coffee cake or hot cross buns for breakfast; the butter on the dinner table would look like a wooly lamb; ham was the meat of choice. We had the Bunnies on the Lawn salad, (recipe appeared in post #19); and dessert was a pound cake baked in a special lamb-shaped mold. The baking, assembling and decorating process for that cake was complicated and time consuming. Each Easter, as I stood before the finished cake lamb, I sighed with tired relief. I did look forward, however, to the Easter Nest Coffee Cake. This wonderful sweet bread is so pretty, it can be the centerpiece for the Easter breakfast table. (If you are not up to making your own bread, I would think frozen dough could be thawed and used and might produce a similar-looking coffee cake; the flavor would not be the same, however). 1 pkg. Hawaiian Sweet Bread, bread machine mix. Mix bread following pkg. directions for dough cycle only. *After removing raised dough from machine, shape one-third of it into 6 'eggs'. Place these close together in the center of a greased baking sheet. 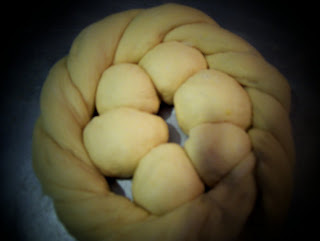 For the 'nest', shape divide the dough into two ropes, each 26 inches long. Twist these together and coil around the eggs. Seal the ends to make the coils look continuous. Cover and let rise in a warm place until double in size (about an hour). Bake 375 degrees for 15-20 minutes. Cool. Frost eggs individually and sprinkle each with it's own color of candy decorations.Tint coconut with green food coloring. Frost nest part of the cake, (coiled dough edge), with confectioner's icing and cover with tinted coconut. 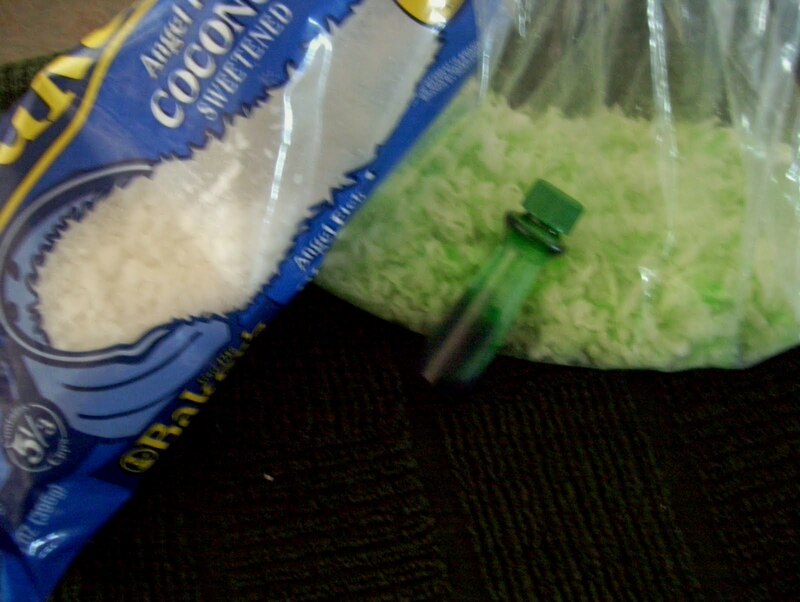 How to tint coconut: Place desired amount of coconut in a clear plastic bag. Add a few drops of green food coloring. Close bag with your hand and shake the contents rapidly to distribute the coloring. *Note: Since my kids are grown and out of our 'nest', I decided to divide the dough in half before shaping. The dough ropes were 18 inches long.This gave me two smaller coffee cakes...one for our Easter breakfast and one to give away. Add ingredients to bread machine to mfg. 's specifications and follow directions above. I tweaked this recipe to give me a light, moist, slightly sweet bread with a hint of lemon...it is delightful. By Hand method: combine yeast and 1 1/2 C flour and potato flakes. Heat water, milk, sugar, butter and salt just till warm, stirring to melt butter. Add vanilla and lemon. Add to dry mixture; add eggs. Stir for 4 minutes constantly. Stir in enough of the remaining flour to make a soft dough. On floured surface, knead till smooth and elastic, about 8-10 minutes. Cover and let rise in a warm place until doubled. Continue from *. Bread loaf instructions: Remove dough from machine and punch down, form into loaf. Put in greased bread pan, cover and let rise until doubled. Bake in a 350 degree preheated oven for 30 minutes. If necessary, cover lightly with foil part way through baking process to avoid over browning. Kenda said:I LOVE YOUR BLOG! The Easter dishes are fabulous! My family always made this nest too, thanks for sharing the recipe. 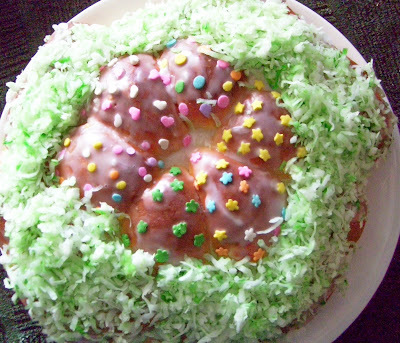 This Easter cake looks great! This year I'm taking a breather and getting my Easter Dessert from http://www.crumbcakecreations.com. They offer many different types of cakes, my favorite being pumpkin. My kids enjoyed the cake so much at our last family gathering, I wouldn't think about NOT having another new jersey style crumb cake around for Easter! Jennifer does an incredible job baking and her cakes are definitely worth trying! You nor your family will be disappointed!